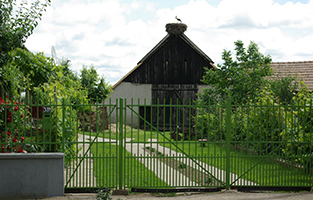 The village is located in the nature preserve “Urziceni Ash Tree Grove“ close to the Hungarian border. In 2003, a border crossing between Urziceni (Romania) and Vállaj (Hungary) was established. This crossing is also a good way of entering and leaving the settlement region of Swabians of Satu Mare. 68 percent of Urziceni’s (German: Schinal, Hungarian. Csanálos) 1509 inhabitants in 2011 were Hungarians, 22 percent Germans/Swabians and nine percent Romanians. Archaeological findings of recent years have uncovered one of the vastest Neolithic necropolises of the upper Tisza basin. Urziceni was first documented in 1431 under the name of Chanalas. It was long in possession of the House of Károly, which directly descends from the House of Kaplony. During the Kuruc Uprisings, the village was destroyed heavily and the population diminished. In the early 18th century, only a few families remained in Urziceni. Count Sándor Károlyi settled Swabians from Württemberg in the region. In 1712, Count Károlyi brought the first Swabians to Urziceni and in 1730, already 84 Swabian families lived in the village. With the growing population economic success came to the settlement. In the 19th century, Urziceni is described as “one of the biggest, tidiest, most beautiful and wealthiest settlements of the region”. In January 1945, 247 Germans were deported to the Soviet Union to do “reconstruction work”. A migration wave that began in 1980 and had its peak in the 1990s lead to a decrease in the number of Swabians. The old Roman-Catholic church of Urziceni was erected in 1725. In 1832, it was destroyed by a fire. The original building can be seen in an image of Saint Floriani, which is presented in the modern Roman-Catholic chuech. The new church was built in the early 20th century and enlarged in 1930. On the way to Urziceni-Pădure through the Ville Negre (Black Vineyard) the vineyard chapel Saint Nepomuk can be found. It was built from wood in 1737 and rebuilt in stone in 1777. The Nepomuk altar inside is worth seeing. Many of the farmhouses in Urziceni are well preserved. Urziceni is a rare village without house numbers. All houses are still called by their old original names. Normally, the names refer to the Swabian settlers who first lived in them. Often, even the inhabitants themselves are rather identified by their house names than their surnames. 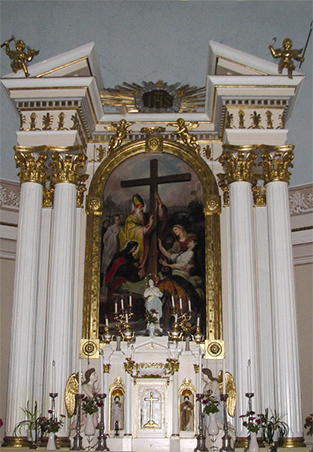 Altar of the Roman-Catholic church in Urziceni. Storks often find a home on the broad barn roofs.